Today, the novel Manitoba Forward/United Fire Fighters of Winnipeg 2014 Winnipeg Mayoral Election crowd-funded survey results were released. And even though the results were already plastered all over the internet while I was still at work, I am still proud to have been a sponsor of this poll. Not only that, but 40% of her supporters are “very certain” that they will continue to support her — the most among the leading candidates. With 28% of the sample voters undecided, this locks her in with a solid 11% of the vote. Judy, obviously. She has a healthy lead and a strong base of support. 71% of provincial NDP voters are behind her to one degree or another. Her results are not going to drop by very much, but on the other hand, nor are they going to rise very much. She will probably maintain most of this support if she can avoid major blunders. 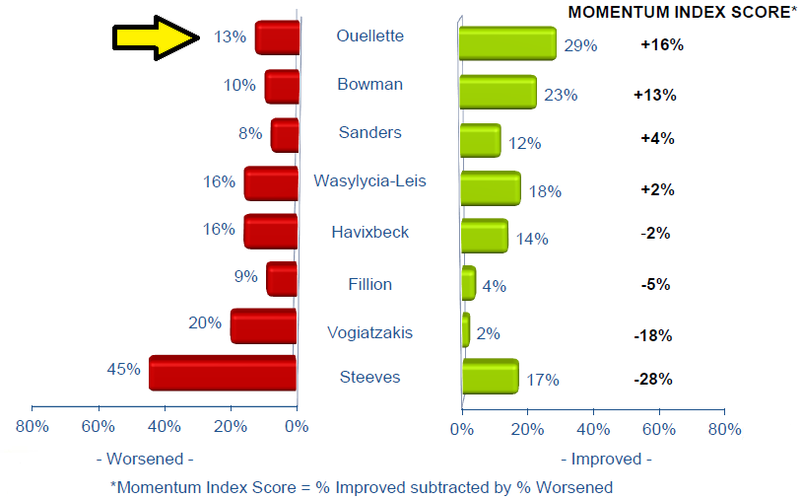 The momentum stat should be viewed cautiously. If your perception changes among people who have no plan on voting for you anyhow, then it really doesn’t matter. However Ouellette’s results mean he’s making a good first impression with a lot of people. This shouldn’t be a surprise as he’s a likeable person and has engaged voters more than most, including with his innovative Reddit “Ask Me Anything” sessions. One BIG area of concern for Ouellette is that he ranked very low among voters on the issue of infrastructure, and infrastructure was by far the most important issue for respondents. Just 4% of people who had an opinion, thought that RFO was best in this area. If he’s going to make sizable progress, he is going to have to convince people that he can fill potholes. David Sanders. Why on earth would somebody with only 4% of the vote be happy with that? Because he had only entered the race two weeks prior to the polling and was relatively unknown, yet scored above two other candidates and within margin of error of Paula Havixbeck. That means that at least some people recognize that he has credibility, which could lead to more press coverage, invitations to debates, and that sort of thing. No doubt the odds are long against Sanders getting into office, but he may end up playing spoiler and affecting the outcome some other way. Maybe not what he intended, but I think he’s a good addition to the race none the less. Who should be somewhat pleased? Gord Steeves. Though well back from Judy, Steeves’ result is not bad considering he was recovering from a PR debacle involving racist Facebook comments at the time the poll was taken. The controversy is reflected in the momentum numbers shown above, but while his impression worsened among many people (many of whom I suspect would not have supported him anyways) it may have solidified support among others. He is ahead of any other “right of center” candidate which makes him the top choice of righties for defeating Judy — for now. Brian Bowman. I am sure he was hoping for more, but Bowman did not have much name recognition going into this shindig. He is equally liked by men and women; he is the second choice of people who support Steeves, so if another scandal hit they might run to him; and he is seen as competent on all issues except addressing poverty and homelessness. One surprise, given Bowman’s youthful appearance and reliance on social media, is his lack of support among younger voters. Perhaps the 18-34 demographic view his rah rah twitter presence as shallow and uninspiring, while the older ladies see him as a nice clean cut young man. Perhaps he should adjust his campaign strategy accordingly. Michel Fillion. Was he expecting more than 1%? Hazem Aslan: He was not registered at the time, therefore has no results and has nothing to be upset about. Voters. The leading candidate’s campaign has been based mostly on tweeting photos from events and announcing that she supports things that are universally supported. She has absolutely no incentive to rock the boat with unique policy ideas. If she keeps doing what she’s doing she will likely be mayor in the fall, and that’s bad news for voters who want somebody with new ideas at city hall. Paula Havixbeck. You can slice and dice the numbers all you want, but there is no getting around the fact that these are bad results for The HavixMeister. She has experience. She has name recognition. She has only 7% support. One silver lining is that Paula’s campaign was not in high gear when the poll took place — In fact I’m not sure it was in gear at all. I think they were still in the garage twiddling with the timing belt when everyone else was racing around the track — but now that she’s making policy announcements and generally getting things in action she may pick up steam. I think Paula used to be a competitive cyclist because her strategy seems to be to draft the other candidates while waiting for the perfect moment to make her move. Note to Paula: A Google search of “paula havixbeck for mayor” turns up your web site as the 27th result, on page 3. NO ONE goes to page 3 of Google. As a basis of comparison this blog is the #3 result of “winnipeg roundabout”. 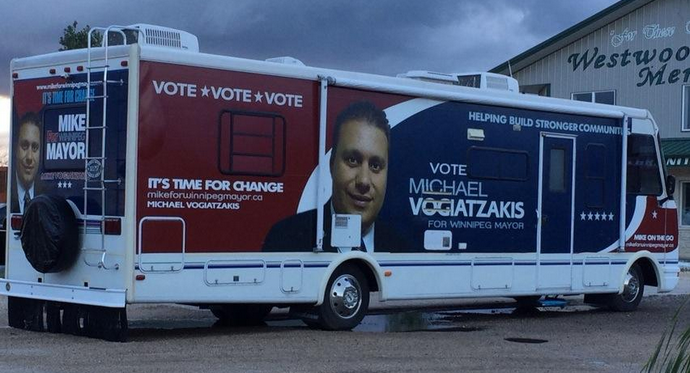 Mike Vogiatzakis. I believe Mike V was in fact expecting more than 1%. He has a professional-in-appearance website and he seems to fancy himself as a legitimate contender, yet the results are not panning out for him. You might recall that Mike V burst on the scene in the spring with a specific plan to fix potholes, yet even on the issue of infrastructure he could only muster 2% support. RFO is the most popular second choice of supporters of Judy W-L, and his momentum and recognition is growing. It is possible that he could slice away at Judy’s support enough to make a difference. 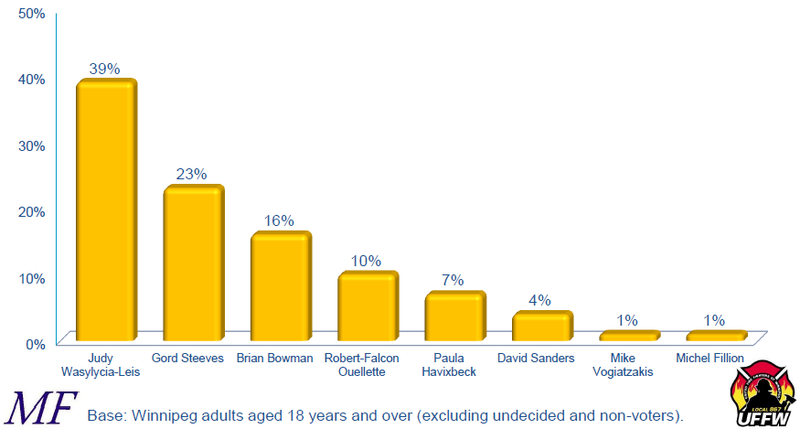 Steeves is more established and higher in the polls, but is more polarizing. Bowman is newer and lower in the polls but has more momentum and is more popular as a second choice of other candidates. They both have reasons to stay in the race and believe that they have a shot. I don’t see one of them stepping down unless something changes. It happens on occasion — where someone unexpected bursts into the lead. We’ve seen it before. Maybe not here, but elsewhere, and there is nothing saying it can’t happen here. Of the three, Robert has the best shot because he’s the new guy with the new ideas, and he is already second choice of Judy voters. Someone new who hasn’t declared yet swoops in out of nowhere with great visions of the City and races to the front if the pack and their momentum carries them into City Hall in October. Ex: 10 years ago, Sam came late and swept up the popular vote. Sam’s a “special” example of a persona. Not many can match him, Certanly no one in the peg can. I dare say, if he ran again, he’d win.